There is a lot of misinformation concerning olive oil on the Internet. 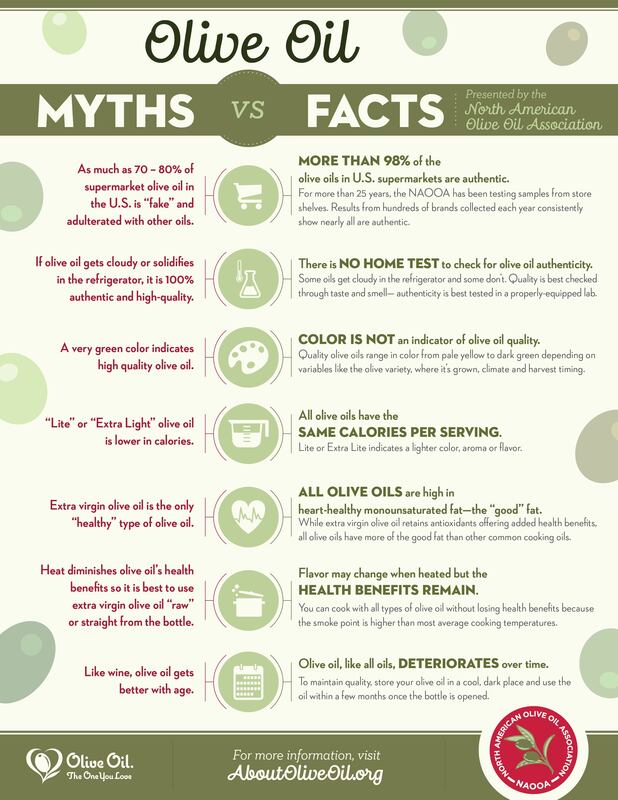 Here's a side-by-side look at the myths and facts about olive oil. As much as 70 - 80% of supermarket olive oil in the U.S. is "fake" and adulterated with other oils. More than 98% of the olive oils in the U.S. supermarkets are authentic. For more than 25 years, the NAOOA has been testing samples from store shelves. Results from hundreds of brands collected each year consistently show nearly all are authentic. If olive oil gets cloudy or solidifies in the refrigerator, it is 100% authentic and high quality. There is NO HOME TEST to check for olive oil authenticity. Some oils get cloudy in the refrigerator and some don't. Quality is best checked through taste and smell–authenticity is best tested in a properly-equipped lab. A very green color indicates high quality olive oil. COLOR IS NOT an indicator of olive oil quality. Quality olive oils range in color from pale yellow to dark green depending on variables like the olive variety, where it's grown, climate and harvest timing. "Lite" or "Extra Light" olive oil is lower in calories. All olive oils have the SAME CALORIES PER SERVING. Lite or Extra Lite indicates a lighter color, aroma or flavor. Extra virgin olive oil is the only "healthy" type of olive oil. ALL OLIVE OILS are high in heart-healthy monounsaturated fat – the "good" fat. While extra virgin olive oil retains antioxidants offering added health benefits, all olive oils have more of the good fat than other common cooking oils. Heat diminishes olive oil's health benefits so it is best to use extra virgin olive oil "raw" or straight from the bottle. Flavor may change when heated but the HEALTH BENEFITS REMAIN. You can cook with all types of olive oil without losing health benefits because the smoke point is higher than most average cooking temperatures. Like wine, olive oil gets better with age. Olive oil, like all oils, DETERIORATES over time. To maintain quality, store your olive oil in a cool, dark place and use the oil within a few months once the bottle is opened.